Bulkhead doors would also be shut down in the event of an emergency such as flooding. The aim was to isolate the compromised (flooding) compartment so that other compartments remained invulnerable. Again, in 1966 or 67 we were working in a very deep part of the Atlantic when we experienced a serious flood in the Engine Room. We were at 500 feet when the Port After Services Anaconda Hose let go. Without getting into the complex details of the system, the Forward and After Services provide seawater for cooling various motor and thrust block bearings, generator and main motor air coolers, HP Air Compressors heat exchangers and domestic (heads) flushing systems to name only a few. Seawater enters the pressure hull of the submarine through a hull valve and is connected to the resiliently mounted pumps via flexible hoses commonly known as anaconda hoses due to their resemblance to the snake of huge notoriety. The Port After Services Hull Valve is in behind the Port Donk (engine). 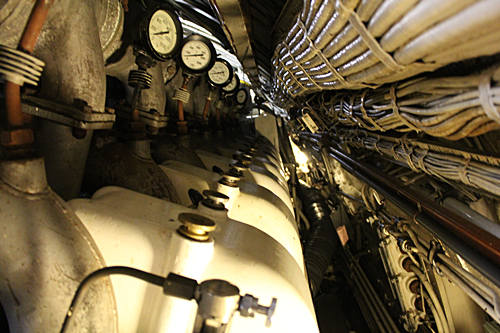 The tight space and maze of pipe work and equipment make it difficult to access. The resilient mounts on the pump and the flexible lines isolate the pump from the pressure hull to ensure that no sound is transmitted out into that underwater arena of stealthy, silent warfare. We would "come unseen" and, more importantly down there, unheard. The water pressure at 500 feet is tremendous. Over 200 pounds per square inch (PSI). FLOODING IN THE ENGINE ROOM." and the submarine went to emergency stations with everyone responding with the appropriate action to attempt to arrest the flooding, pump out the water and isolate compartments. Four bulkhead doors, 34, 49, 77 and 103 slammed shut. Anyone on the wrong side of the bulkhead was out of luck if the flooding wasn't stopped. But in this particular case it didn't much matter because, with the depth of the water beneath us, none of us would live to see the bottom if the weight of the incoming water took us there. We would implode like a beer can in a can crusher. And at 500 feet, the pressure outside was forcing the ocean into the safety of our steel tube at a horrendous rate. I heard the CO in the Control Room order both main motors to batteries in series full speed ahead and full rise on the planes for the bow up angle that was intended to take us shallower to reduce the pressure and subsequently the ingress of water. And also to the roof and the safety of the surface where, if all else failed, we could abandon the submarine. My job, and that of Tom Murray on the 719 Scanner beside me, was to carry out clearance sweeps to ensure that there was nothing in our path that we could collide with or surface under. That could really spoil our day. There was a flurry of activity and continuous stream of orders and reports as the Ballast Pump was ordered into action to pump the rising water out of the Engine Room Bilge. I felt the boat assuming an up angle and could hear the planesman reporting the depth. "500 feet 500 feet 495 feet 490 feet 485 feet 480 feet 480 feet 480 feet 485 feet . . ." The Ballast Pump was losing the battle against the ferocious force of water flooding in through the burst hose of the Port After Services line. We were gaining weight, fast. The screws had lost their grip, just cavitating and churning water. And we were in a back slide. I couldn't help stealing a look at the depth gauge beside me hoping that needle would start turning in the right direction. I could hear the CO ordering the Panel to blow compensating tanks, doing everything he could to make the submarine lighter. 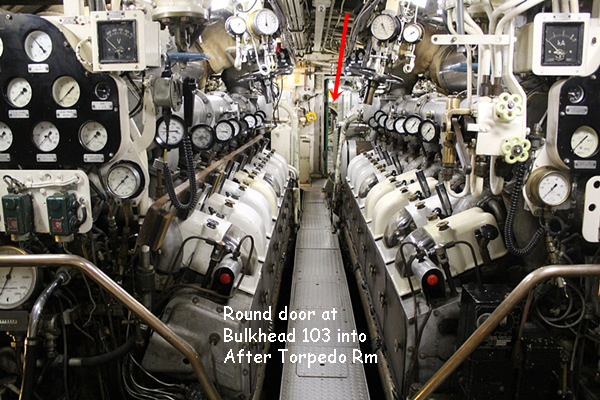 The force of the water pressure surging from the ruptured line was obstructing any attempt by the Donk Shop watch keepers to reach the hull valve from the forward part of the Engine Room. The valve operating hand wheels for each individual system, e.g. HP Air, Main Line, Hydraulics, and After Services, etc. all have unique shapes particular to that system. In the dark you know the feel and can identify the system that the valve belongs to. The one thing in common for all systems is that operating hand wheels for hull valves, critical to the control of hull openings, have a bump on them. Charlie felt his way through the chaos until he recognized the shape of an After Services Hull Valve and was able to shut it and stop the flooding. It wasn't long before the Ballast Pump was in control of the excess water in the Engine Room and we were ascending to the surface. Huge sighs of relief and a rare change of underwear all round. Sample of the types of valve wheels each assigned to a different task. Note the bottom row which have the extra 'bump' which identifies them as being related to systems involving the hull of the boat. Charlie didn't get a medal for his heroics. A Bravo Zulu (Job Well Done) from the CO was it; and he humbly put it down to "all in a day’s work." What qualified submariners do, and nothing more than the stuff mutual respect among that unique brotherhood is made of. Deep down that's what really counts.